There are so many gorgeous options and we’re sure you’ve pinned some beautiful hairstyles on your wedding board. It may be super easy for you to choose one. But, in case you don’t know how to narrow down your options, here are our tips on matching your style to your dress! Just like your dress should fit your vision for your day, your hair should fit the tone of your overall style. And it’s good to think about practical considerations, as well! If you’re going to be outdoors all day, maybe you want your hair in an updo, to keep you cool! If your hair doesn’t hold curl well, that’s something to consider too. A great way to make sure your entire look is cohesive and fits your vision for your day is to think about your original vision! What were the words you used when you were looking for your dress? Romantic? Whimsical? Elegant and sophisticated? Here are our hairstyle suggestions to fit a variety of bridal looks! Our Christos Francis gown is the perfect soft, whimsical dress. It’s layers of tulle and scattered lace applique would be gorgeous is an outdoor garden setting. If your wedding day look is soft and whimsical, consider a loose, messy updo with some fresh flowers. Loose tendrils give a relaxed, windswept look. Pronovias Osera is the perfect chic dress with a touch of glam. It’s intricate lace, gold color, and beaded straps are for a bride who doesn’t mind standing out! Pair a chic, glam dress with a hairstyle that stands out! Try something a little edgy, like an asymmetrical style! Hayley Paige Aurora is a dress to fit an elegant, evening soiree. Her clean lines and mikado fabric are clean and classic, but her dropwaist and other unique details elevate her to a whole new level. If your dress is elegant and sophisticated, try a sleek look, like this high bun. 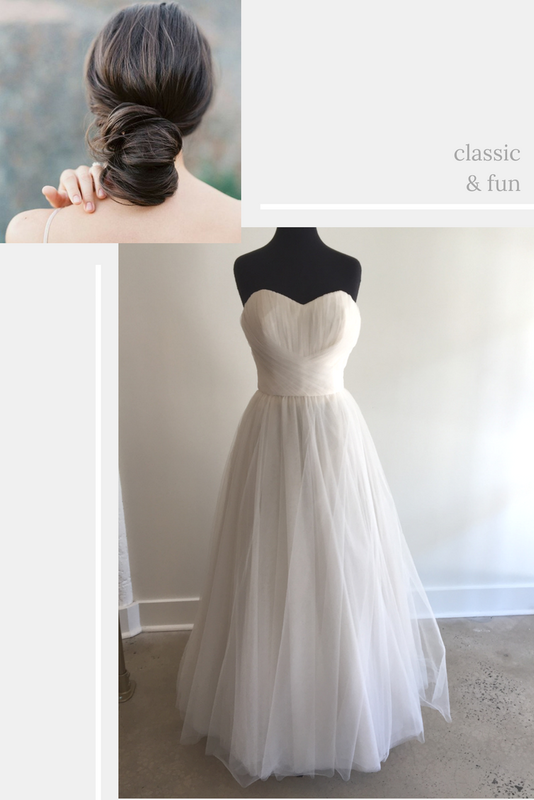 Christos Charlotte is a classic ballgown… with a little twist. The gathered fabric on the bodice and full tulle give her a touch of fun! If your look is classic and fun, try this variation on a chignon. Sophisticated, but a little sassy! Nicole Miller Lauren has our hearts. Her crepe fabric is soft and romantic, so you’ll feel ready to enjoy the day as soon as you put her on. 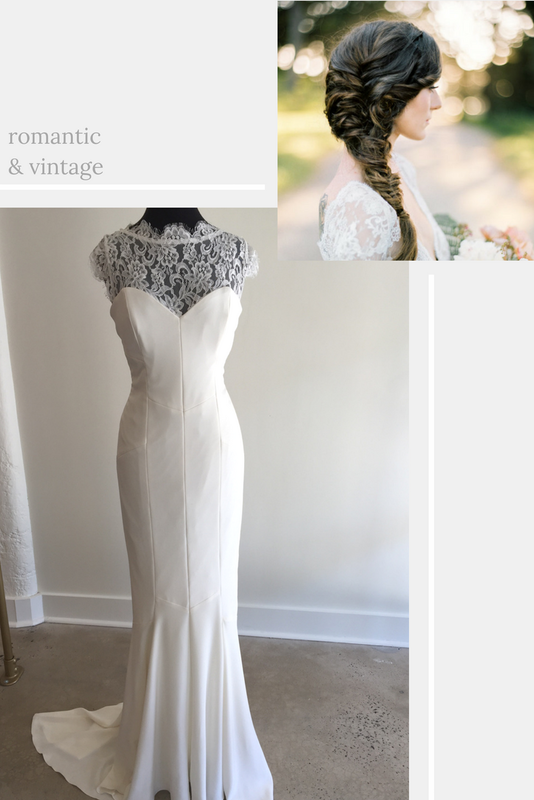 And her lace neckline adds a vintage feel. If you’re a romantic, vintage bride, try a loose braid or fishtail.